An eleven-year-old girl of Nyimba District has committed suicide by hanging herself on a tree using a mosquito net rope. Catherine Tembo of Mushalila in Chief Luembe’s area hanged herself on a tree around 17:00 hours on Sunday. Eastern Province Police Commissioner Alex Chilufya said this happened after the deceased was chased from home by her mother for some misconduct.Mr Chilufya said the deceased sustained a swollen neck and relatives were advised to proceed with burial as no foul play was detected. Sad indeed for such a young girl to think of such an act. Exactly what kind of misconduct would warrant a parent to banish an 11 year old child from home! Poor child…Children are precious, this is a tragedy for the family. Rest in peace little girl, soul searching begins for the mother and my prayer is that she forgives herself and finds peace.. They spend more time with children could be one reason. Don’t get me wrong am not justifying the wrong here. @SPEAR send them some money! Kangachepe….. Sad indeed, but what relevance does the picture have? 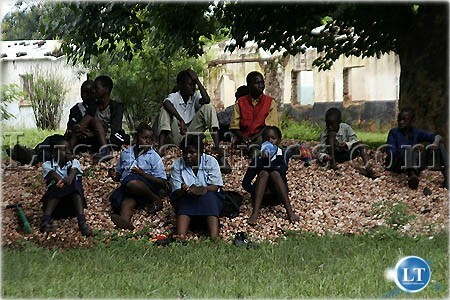 Just to put a picture of some pupils at a school in Nyimba who are not even connected to the story. May your dear little soul rest in peace sweetheart. You don’t chase a child from home under no any circumstances, bad parenting. There has to be an investigation. How do the police know the mother didn’t strangle her child? The women in Zambia have turned into cold blooded vicious murderers without any conscience. Very true Wantashi, its possible that her mother strangled the girl and then hanged her on the mango tree. That stupid woman should be arrested and charged with murder. These women need to be caged as their wrath now is being directed to kids as well. Just recently, the other stupid woman of Lusaka poisoned her children with doom! All this is happening because the women are differing with their husbands. Very sad story. There must more to it than just advising the family to bury her. Child Protective Services must ensure that all Zambian children are protected under the law, even from their own parents. Parents who are unfit to take care of there children must face the law. What a sad story. An 11 year old child, has a lot to look for in life and not expected to commit suicide. God help our country. Ubufyashi bwa pamasaka, children are supposed to be taught both by your own example and humble lessons, anger is not the solution, in fact it is very unwise to try and correct your child when you are angry. Can you now go and chase her from the grave? Ubupuba fye bweka bweka! May her soul rest in peace after hanging herself?? Anyway am not God to judge!! Am sure the mother has been troubling this child for a long time – abuse at play here!